It is unclear as to the exact date when the tradition of Sentou began as a business. The first written use of the word ‘Sentou’ was in the Nichiren Goshoroku, published in 1266. In the Giyon Shikkou Diary in the Yasaka Shrine in Kyoto, it is written that the Godaigo Emperor established a Sentou in the grounds of the Unkyou Temple sometime during his short reign between 1321 and 1324. From these two historical references, we can deduce the long-standing tradition of the Sentou. According to the Keicho Kenbunroku of 1614, Sentou in the Edo Period began in 1591, one year after Ieyasu Tokugawa’s Shogunate moved from Osaka to Edo (modern-day Tokyo) in 1590. Yoichi Iseno was the first person to establish a Sentou public bath, the location of which was near one end of the Zenigame bridge, between the Tokiwa and Gofuku bridges in old Edo. The price of admission was one Eirakusen coin. Let us try to imagine the experience of going to a Sentou in those times. The outside of the building would have been a simple structure, different to the almost Buddhist temple like appearance of the Sentou that can be seen currently in the Tokyo area. 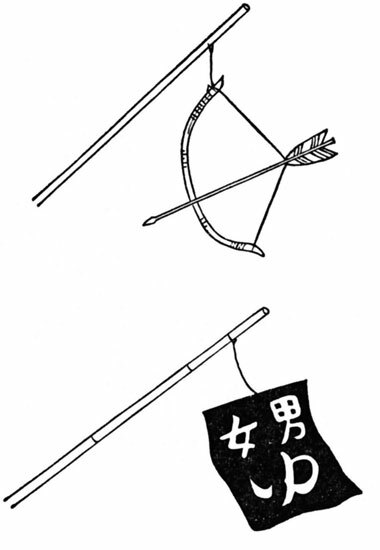 The way one could identify a Sentou was by a bow and arrow hanging at the entrance. This was a visual play on word in Japanese that meant “to be in hot water”. Upon entering, one could see the Bandai (a seat for a supervisor, the same as today), the wooden floored Datsuiba (changing area) and the bathing area all in one room. Even today in certain parts of Okinawa, one can still find the old mixed setting with the Datsuiba and the bathing area in the same area with just one Bandai. The entrance to the bath itself, called the Zakuroguchi, was an opening with a height of only 80 centimeters, designed so that heat from the inside could not escape, meaning one had to bow down in order to enter the bathroom. Because there were no windows in the room where the bathtub was located, it was completely dark. Consequently, in order to warn those entering, those in the tub would purposely make their presence known by clearing their throats. The bathroom was very hot because the steam filled the air and the water was hot, so it was not possible to sit in the water for an extended period of time. Of course, there were no water faucets in the bathing area as can be found in a modern Sentou. 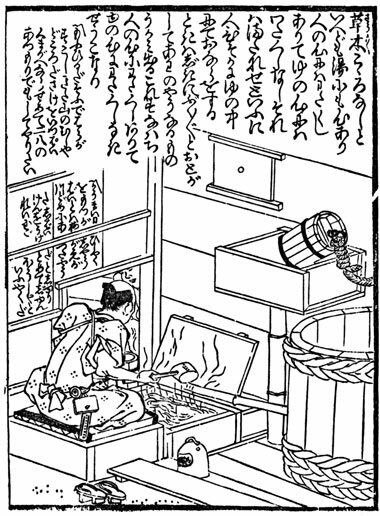 Instead, both the Sansuke (bathhouse attendant) and person manning the Bandai rationed the hot water with a large wooden ladle for the bathers. Even though the Sentou in the Edo Period was small and dark, it still was considered a place for gathering and communication. In a Sentou there was generally a room for resting after bathing on the second floor of the building. This resting ‘salon’ was common up to the Meiji Period (1868 - 1912).